Andrea Bertorelli says the singer's book was "the final straw", damaging her reputation and causing her considerable distress. 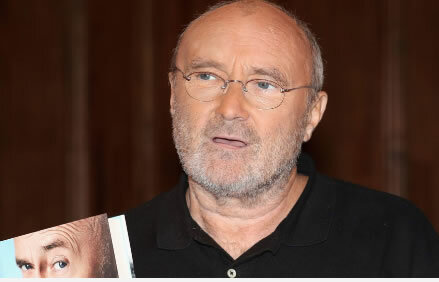 Phil Collins' ex-wife is taking legal action against the singer over "wholly false statements" made in his recent autobiography. The Against All Odds singer married his first wife Andrea Bertorelli in 1975 and the marriage lasted for five years. The couple had a son, Simon, and Collins adopted Bertorelli's daughter Joely. In his latest autobiography Not Dead Yet, the 65-year old singer details his career at Genesis, his rise to fame as a solo artist as well as his personal life. This included accounts of his marriages and divorces. my former husband Phil Collins," Bertorelli said in a statement. She added: "I have variously been portrayed as a homewrecker, a gold-digger and a bad mother. "The recent publication of Phil's autobiography Not Dead Yet is the final straw." The veteran British singer has recently announced a comeback tour title Not Dead Yet, Live. Collins declared he was retiring back in 2011, but in a 2015 interview revealed he had changed his mind. "I stopped work because I wanted to be a dad at home," he said in a press conference. "As bad luck would have it, as soon as I retired, my family split up. I didn't have anything to go home to really. That's when I started drinking." Bertorelli, who divorced Collins on the grounds of adultery, says she has "instructed solicitors to instigate proceedings against both Phil and the book's publisher". "The book contains a number of wholly false statements about myself and my marriage to Phil which have not only seriously damaged my reputation, but have also caused me considerable distress," she said. Bertorelli added; "I am a private person and have never sought the limelight, even during my marriage to Phil. "However, these attacks on my character and integrity are such that I feel compelled to take legal action." Collins and the book publishers have been approached for comment.